In 1985 a group of agility enthusiasts came together to form Dallas Agility Working Group—DAWG—one of the first agility clubs in the US. Their mission was to promote the sport and to sponsor competitions open to everyone. Today, DAWG continues to promote agility through clinics, USDAA and AKC trials, and training classes, which are taught by club members and guest instructors. Our training facility is located at 1725 E. Stone Road in Wylie, Texas. Here is a Google Maps link. DAWG is hosting a number of sanctioned Agility trials, workshops, and fun matches in 2019. See our Events page for details. DAWG chooses Senior Pets Assistance Network (SPAN) as our sponsored charity for 2018 - click here for details. 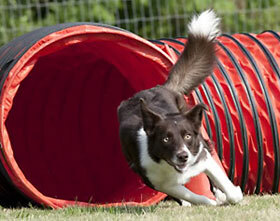 Click here for a Google calendar with DAWG's activities and lots of Agility events listed.